According to the latest update from Black Box Intelligence’s TDn2K research, both same-store sales and foot traffic declined once again in July. This time, the slide was more pronounced than usual. 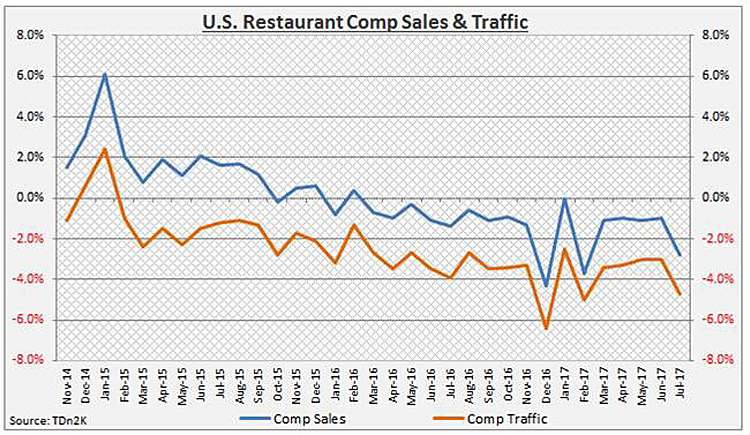 Sales fell by 2.8% and traffic tumbled 4.7%, extending the stretch of year-over-year declines for the US restaurant industry to 17 consecutive months, the longest stretch since the financial crisis. Here’s the chart. Sales rose in only 12 markets while declining in 183. The Midwest was the worst region, suffering a 3.6% and 5.2% decline in sales and traffic respectively. Even the best region, California, posted declines. “While the economy keeps growing at a moderate pace and job gains remain strong, the consumer seems to be on vacation, literally and figuratively,” said Joel Naroff, a TDn2K economist. Industry analysts have been expecting a turnaround…in fact they have been predicting that for months while touting a strong job market and higher wages as the economic trends that would cause a snap back. You can believe the Fed when it says that the economy is strong enough to withstand a normalization of monetary policy. Or you can count the empty seats at your local restaurant. Previous Previous post: Looking a Little Toppy?